Alliance Broken - With the death of Thingol at the hands of the Dwarves (see above), the alliance between Dwarves and Elves in the First Age was officially over. Not just over, but the two races had become instant enemies and went to war. After they killed Thingol, the Dwarves grabbed the necklace, Nauglamir, and fled homeward. "But tidings went swiftly through the forest, and few of that company came over Aros, for they were pursued to the death as they sought the eastward road; and the Nauglamir was retaken, and brought back in bitter grief to Melian the Queen. Yet two there were of the slayers of Thingol who escaped from the pursuit on the eastern marches and returned at last to their city far off in the Blue Mountains; and there in Nogrod they told somewhat of all that had befallen, saying that the Dwarves were slain in Doriath by command of the Elven-King, who thus would cheat them of their reward. 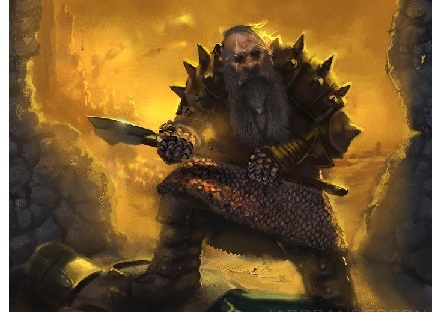 The Dwarves are stalwart warriors, and they caught the Elves unawares. And the great city of Menegroth lay in ruins.